And so we have a tale of two recent NPR holiday cooking pieces. One drew no complaints. The other came across to some listeners (largely in the public radio community itself) as so promotional that they questioned whether it was paid content on behalf of an NPR sponsor. That's the one I'll focus on first. A listener to KUOW in Seattle wrote to say that he thought the radio piece "sounded a little infomercial-ish. I appreciate NPR indicating before the piece that Blue Apron is a sponsor. I am going to assume the sponsorship had nothing whatsoever to do with the fact that Blue Apron got a spot on Weekend ATC. I hope I'm right." For the piece, Weekend All Things Considered host Michel Martin went to the Blue Apron test kitchen in Brooklyn and cooked three Thanksgiving-themed dishes. MARTIN: Chris Sorensen is the culinary director for Blue Apron. That's one of the big players in the world of meal kit delivery services along with others you may have heard about like HelloFresh or Sun Basket or Purple Carrot. Now these are the companies that come up with recipes, gather the ingredients and instructions and send them all to your door, so you can get a delicious dinner on the table with as little drama as possible and perhaps even learn a trick you haven't tried. Blue Apron also just released a lavishly illustrated new cookbook. That's why, when we were in New York recently, we stopped by the company's test kitchen in Brooklyn to talk about coming up with recipes, getting comfortable in the kitchen and getting ready for Thanksgiving. Oh, let me also just mention that Blue Apron is an NPR sponsor. Martin's use of "delicious," and what was essentially a description of the company's business pitch (which, to be fair, is also the premise of the other Blue Apron rivals she cited) do indeed come off as promotional. This might seem especially so because the company had recently reported mixed financial results. Meanwhile, Gabe Rosenberg, digital news editor at NPR member station WOSU in Columbus, Ohio, and a former NPR intern, kicked off a Twitter debate with this reaction to the website version of the story: "Is this... a sponsored post from @NPR?" That version consisted largely of recipes from the radio piece under a headline that read: "A Blue Apron Thanksgiving: 3 Recipes To Try At Home." It drew criticisms that the headline, the lack of framing and the sponsorship disclosure itself all combined to make the piece "read like a native ad" for a sponsor, as Nathan Lawrence, reporter and digital coordinator for member station KBIA in Columbia, Mo., put it. (A "native ad" is another phrase for advertising disguised to appear as editorial content). Kenya Young was the executive producer of the weekend edition of All Things Considered at the time the piece was conceived (she is now acting executive producer of Morning Edition). She told me the cookbook was sent to her with a pitch back in September, per her recollection. (This is routine; NPR's offices are flooded with all sorts of new books seeking exposure, and the vast majority do not make it on the air.) She said she and Martin were "intrigued" by the idea: "The whole point of the company's business is to cater to people who don't really want the fuss of recipes, yet here they are creating a cookbook that does just that." Young said that a straight conversation in the studio with a Blue Apron representative was considered potentially "too promotional," however. Instead, she said, they "sat on it, waiting to see if there was a way in to do it." When a reporting trip by Martin to New York was scheduled for another story, she said, they thought, "ah ha, we can go by the test kitchens, and do a pre-Thanksgiving cooking in the kitchen segment. Simple as that." 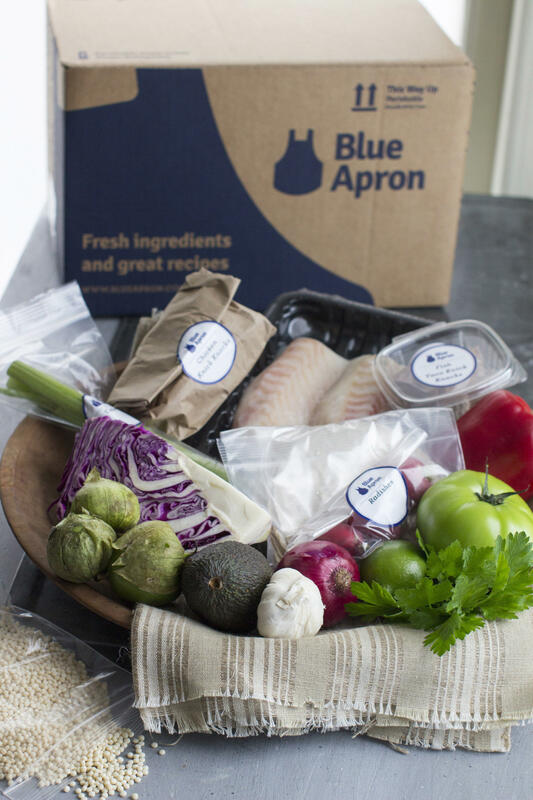 Young added, "we purposely tried to stay away from the [Blue Apron] meal kit talk (except trying to set up who they are and what they do) because we DIDN'T want it to sound at all promotional — in fact on several occasions during the interview when it did venture into Blue Apron the company or the product instead of Blue Apron the cookbook, both Michel and I asked the chef to redirect to only talk about the cookbook and cooking in the kitchen." Young said there was no consideration at any point of whether they should or should not do the piece because Blue Apron happened to be a sponsor. Martin told me she had no idea Blue Apron was an NPR sponsor until after the piece was done. The disclosure was added at the last minute, the day that the piece ran. It did in fact sound like a casual afterthought, with Martin saying near the top of the piece: "Oh, let me also just mention that Blue Apron is an NPR sponsor." While Young said that perhaps the disclosure did "more harm than good," Mark Memmott, NPR's standards and practices editor, said he believes it was necessary. "It was better for us to be transparent and take some hits. I suspect there would have been even more criticism if we hadn't disclosed the connection." He and I agree on that. He said he thought the segment was "handled well. The journalists at Weekend All Things Considered looked at the cookbook, talked about whether it might be of interest to the NPR audience and came up with an angle and approach that were fun and informative. Through the process, they didn't let Blue Apron's financial support for NPR affect their thinking. It shouldn't. Obviously, our journalists don't do 'paid content.' But should we automatically rule out some stories because they involve our sponsors? How is that fair and how does it serve our audience?" Fair enough, but this was a case where all the elements combined to create an appearance that NPR was supporting a sponsor, even if it wasn't. Once the connection was made internally, it seems to me there should also have been some adjustment to acknowledge how the audience might perceive the piece (although by then it may have been too late). Had there been time, the staff could have added context with a reference to the 2016 cookbook from Blue Apron rival Plated, say. Or, excised "delicious" from the script, as Young acknowledged could have been done. Memmott, too, told me: "It wasn't our place to use the word 'delicious.' Michel didn't intend it that way, but it could come off as promotional." The headline was also a problem, as Memmott told me: "We shouldn't have used 'A Blue Apron Thanksgiving' in the headline for the same reason. Something like 'Not Comfortable In The Kitchen? These 3 Recipes Might Help' would have been better, in my opinion." Other things could have helped, as well, and that brings me back to that contrasting cooking piece that aired the day after Thanksgiving. It featured chef Massimo Bottura cooking from scraps in the NPR kitchen. Like the Blue Apron piece, it was tied to a new cookbook, from Bottura. But Bottura is not mentioned in the digital headline, and his book itself is not mentioned until the end of either the radio or digital pieces. Instead, the pieces are built around the theme of kitchen waste. Quotes from an outside expert from the Natural Resources Defense Council added context. The result feels organic, not promotional, at least to my eyes and ears, and I think I'd have felt the same way even if Bottura's book publisher were a sponsor (it is not, as far as I've determined). Are there any lessons to be learned here? NPR cannot, nor should it, avoid reporting on sponsors, whether the story is positive, as in this case, or negative. And those sponsor disclosures are key. But NPR still needs to do everything possible to avoid creating an appearance that it is doing a sponsor's bidding. In this case, at least, more attention to tiny details could have made a difference.